Learn how to create your English fluency wedge in episode 4 of the Power Learning Podcast! Episode 4 updates the great progress of the winners of our Master English Conversation Scholarship Contest as they finish their month in the program and gives the second tip for everyone about how to create your “wedge” to fluency using your talents and interests. I also answer questions about learning, and myself, received on Facebook. Our four winners are all making great progress and you can too with this podcast episode! Hello, and welcome to the fourth episode of the englishanyone.com Power Learning Podcast. I’m Drew Badger, English speaking confidence expert, and Co-Founder of englishanyone.com, and today we have kind of a special double edition of the power learning podcast. I’ll be answering some questions from students, uh, that I received on Facebook, and also I’ll be talking about our fantastic scholarship winners. They’re moving into month number two on the englishanyone.com Master English Conversation Scholarship Contest. So they’ve already been studying with Master English Conversation for about a month, and they’re making fantastic progress. So we’re going to be talking about both of those things, and also provide this month’s tip for them and for everyone else listening, so that everyone can continue improving their English. Let’s get started. All right, we’ll jump right into questions, and if I mispronounce your name, I apologize, because I just don’t know every language on the planet and there are so many different kinds of names, and so if I mispronounce your name, then I apologize for that. So the first question comes from [Swatharedi ?]. How do we increase our vocabulary? How do we increase our vocabulary? Well, this one is…it’s not such a tricky thing, but it really depends on how you learn your vocabulary, and what kinds of things you like to study. So, for instance, if you get a book, uh, you know, maybe some people, they like to actually sit down and just open the dictionary and get words out of it and start studying that way. But I find it’s a lot better if you find something you’re interested in, obviously, and then begin studying the vocabulary that way. The first thing you want to remember is that it’s better to learn phrases than it is to study individual words, because the way the mind works, the way your brain works, it’s a lot easier for your brain to remember a series of words as a story than it is for you to try to remember a list of vocabulary words. So, first, you have to think about what it is you want to practice, what kinds of words you’re interested in use…in using, or if you have, uh, like a certain kind of job, like one of my students works at a bakery, so she has to learn a lot more vocabulary for people coming in and asking questions about cakes and pies and that kind of thing. So if there’s a specific focus that you need to work on, then your attention should be on that. But, again, whatever you’re interested in, begin with phrases as a group. If you have to learn individual words, make a story so you can make them more memorable, or learn actual phrases so you can build your vocabulary. If you really want to remember individual words, it’s much better if you break them down into prefixes and suffixes. Now, let’s say you learn the first piece of a word, like bi for bicycle. I use this example a lot with students. So you’ve got basically two pieces in bicycle. You’ve got bi, meaning two, and cycle, meaning a wheel, or turning, or a circle. So you’ve got two circles. So now that you know bicycle, you can learn other words that also have cycle in them, or bi in them. So instead of learning one word, you should be focusing on learning lots of prefixes and suffixes, because these will give you the pieces of the words that you can combine to make many, many more words, and you’ll understand a lot more words that way. So, just to sum up, if you want to master vocabulary, start very small with prefixes and suffixes, but also be very big, and this is remembering, uh, new words and phrases through stories, because it’s much better to remember a whole group of things than it is to just try to remember one word, or a list of words that it really just won’t go into your brain that effectively. All right, I hope that answers your question. If not, just ask me. You can make a comment down below this video, or on Facebook, or wherever else you happen to see me. All right, let’s move on to [Aya ?]. So we’ve got three question from Aya, and I will do my best to answer all three of them right here. All right, so the first one is: Do we have to study all idioms? Do we have to study all idioms? Well, I suppose if you know every idiom that would be fantastic, but it’s not really that…I guess it’s not really that easy to do. But it’s much better to focus, again, just like mastering vocabulary, it’s much better to focus your time on the things that you experience every day. And, usually, there’s a, uh, kind of an 80/20 rule, so you don’t need to learn 500 words, you only need to learn maybe 100 words, and then you can use those and you use those more frequently. So, listen to movies and you will tend to hear people using a lot of the same idioms over and over again. There are certain idioms for business, there are certain idioms for sports, certain idioms for romantic relationships, and a lot of these you hear them over and over again, and those are the things that you should be listening for. So don’t worry about trying to memorize a whole list of idioms, just listen to conversations, and anything you don’t understand, it’s probably an idiom that’s coming in, especially if it’s a group, uh, of a few words and you don’t really understand what the meaning is because the actual translation of it would be really funny. So think about idioms that way, uh, and you don’t have to worry about studying all of them, but you can give it a try if you think you can do it. All right, the next question, this is an interesting one as well. Uh, what do I think about watching movies with subtitles? What do I think about watching movies with subtitles? It’s a good question, Aya. I think the most important thing to remember about subtitles for movies and TV shows is that if you can, watch the movie in the same language that the subtitles are in. You can always learn a little bit from…like let’s say I speak Arabic and I’m watching an American movie. Uh, if the subtitles are in Arabic but I’m watching in English, uh, then my brain is kind of getting two different ideas and I have to focus, uh, on one or the other. Usually the spoken English or the written Arabic, in that case. But if you can, watch, uh, a movie, like an English movie with English subtitles and it’s actually the same exact words that are being said in the movie or TV show. I think that’s a great idea. Subtitles aren’t a bad thing, but obviously you’re not going to get a 100 percent perfect translation of something. So you’ll get a pretty good translation, but it also can be a little bit distracting. So if you can, listen to a movie or TV show with the English sound on, but also watch the subtitles at the bottom in English. So it’s not a bad thing if you use your own language for subtitles, but if you can use English, then that will give you, uh, a much better means of connecting to the language, because they’ll say one thing and you’ll really get to see it on the bottom of the screen. I think one of the reasons that, uh, many Japanese people are good at reading, they have a very high literacy rate here…A literacy rate means the number of people that can read in a population or a group of people. But the, uh, Japanese TV, there’s so much writing on the screen. If you go to YouTube and just watch a Japanese game show, they always have things written on the screen, and so even if you’re just listening, uh, you can still learn a little bit, or learn some kanji, this is the Japanese characters, uh, the Japanese written language, one of them. Uh, so I learn, actually, a lot of new Japanese words by also reading them, and understanding what people are saying. So, again, I’m, listening to Japanese, but I’m also reading the Japanese characters that are on the screen. So as best you can, listen in English, watch in English, and read in English. All right, and the final question from Aya is: What makes me must happy? What makes me most happy? That’s a very good question. Actually, what makes me most happy is seeing people learn. I think, uh, even from a young age, I always felt frustrated when I couldn’t learn something, or I couldn’t understand something. I was never a very good reader when I was younger, and I was always like kind of, um, not very good at school. I got much better as I got older, but it was the same thing I experienced as a language learner, and I got really frustrated because I just couldn’t under…understand Japanese, no matter how hard I tried. And I think when I really got to see, like, wow, like when I really understand something, that’s really what makes me most excited. It’s really what I can get excited about. And I’m always happy to see other people when they actually learn something. You can really see it in a student’s face when they finally understand something, and they really make progress, and that’s really what makes me happy. So being able to learn something, and also seeing other people when they’re able to learn, that really makes me happy. And, in addition to that, I really like having interesting conversations with people about all kinds of things. So thank you very much, Aya, for all those questions. All right, next one is from [Steffi ? ], and this is: What books do I recommend for learning English? Again, this isn’t a specific thing I would recommend, it just depends on your level, what you’re interested in. I’ll give you an example from my own life about reading. So, as I just explained, I was not a good reader, I hated reading when I was younger, and I knew my mom and my dad wanted me to become a better a reader, they wanted me to read more, but I just hated it. And I didn’t have, uh, a real bridge or a connection, something that really made me interested in reading. Uh, so it wasn’t that there was a, uh, a specific book that I had to read in order to like reading, but what I needed to find was something that was interesting to me. And it was actually Eastern philosophy, it was a comic book I found, uh, that got me really interested in wanting to read more. And the only way I could learn more about that subject was by reading. I couldn’t watch movies about Eastern philosophy, really. Um, maybe there are some, but I couldn’t find an, so…So the…the thing that I want you to think about is find something that you’re really interested in. If you like flowers, then read a book about gardening or flowers. Or it’s the same thing with movies. If you like action movies, then watch an action movie in English. You shouldn’t be looking for a specific, ah, this is a good book for learning English, because for each person it’s a different kind of thing. And in you becoming a better English learner, I want you to really open your mind and not look for a specific thing that works for everybody. The real secret to success is finding the thing that works for you, because each one of us is a little bit different in how we learn, and we all have slightly different interests, or even very different interests. So really think about what it is you’re interested in, and then connect that with what you’re learning. So it’s the same thing I always recommend for people wanting to go out and meet native speakers to practice with. Don’t worry about trying to tell them that you’re an English learner, or you’re asking them questions about English. Ask them questions about things in the interest that you have. So if you like gardening, or you like animals, or you like any…whatever the thing is you like, talk to English speakers about that sort of thing. Watch movies about that thing Do things in that using English. Go to a bookstore and read a few pages of something and see if it’s too easy or too difficult. You want to find something that gives you at least 80 or 90 percent of things that you already understand, so that when you read something new, then that new information will go into your mind much more easily. So don’t find a…a really difficult book that you need to have a dictionary all the time for, find something that’s fun and interesting, and then you will really start enjoying your practicing much, much more. So, thank you very much, Steffi. That was a great question. And last one is from [Clare ?] about actually English learning. So this one is: Where can we find good resources, good free resources, for downloading things for test preparation? Now, uh, in my case, I don’t focus on teaching for tests. I like to help students build their vocabulary, and that is effective for taking tests, but I honestly wouldn’t know. I’m not the best person to ask about, um, where people should go to get free information about that. But I’m sure there are plenty of videos online, especially at YouTube, and there are a lot of other free resources that you can use in order to, uh, experience, uh, much higher scores on your tests. So if you search for the specific tests you’re going for, uh…and for searching, keep in mind that many English…English speaker are…are typing these pages, so, you know, try to think like an English speaker. And so I am looking for TOEIC test prep, or something like that, and you’ll get, uh, lots of information about that from other people. So I apologize, Clare, that I don’t have more examples of specific things for tests, but there are plenty of resources out there, I’m sure. One thing connected to this that I will say is that really think about what your goal is. If there is a specific test you have to take, and you have to get a good score on that, then do study a specific test prep book, if that’s really what you want to do. But if you really want to become a confident, fluent speaker, uh, there are much better ways to do that. And so you shouldn’t worry about a test so much, uh, unless that’s exactly something required by a school, or a job, or something like that. All right, the last question is from [Trip ? ], another friend of mine on the, uh, the teachers’ circuit here, another fellow teacher. Uh, and he asks me how long have I been in Japan. How long have I been in Japan? Well, I came to Japan in 2003, so it’s been almost ten years now, but on and off. I really love this expression. It’s a very simple way of saying that you start something, and then stop, and then start nit again for a little while, and then stop. This is to do something on and off. On and off. Just like a light switch. Click, click, click, click. On and off. So I’ve been in Japan maybe…I’d say about eight years, uh, but if you want to say on and off, I’ve been in Japan about ten years. So I lived in Japan from 2003 until 2006, and then I moved to Alaska, and I lived in Alaska for a few months, and then I lived in Seattle for about two years, and then I came back to Japan, and I’ve been here for, I guess, five or six years now. So, it’s been on and off about ten years. Well, I hope, uh, those answered people as…as best they could. Uh, I’m always happy to ask…uh, or answer questions, I should say. I’ve…I’ve got lots of questions of my own, but if you have any more questions about how to learn, just comment below this video. I’d love to answer some more questions from people. It’s more interesting than me just talking about random things all the time. So if you do have questions, and I’m sure you do, uh, just go ahead and ask me. There’s no such thing as a bad question, and I’m always happy to reply with, uh, an answer as best I can. All right, well, now we’ll move into part two of this podcast episode, and I’m really, really excited for you to listen to the difference between even just one month of practicing with Master English Conversation. I’m so proud of the four learners that we’ve got on our program, uh, and I’m…I’m really so excited. I’ll let them introduce themselves again, tell you what they think about the program, and what they’ve learned so far this month. So, if you remember last month, I gave a kind of special tip for everyone, uh, and this was how to kind of improve your accent and how to really get…get into the flow of English, just the way I’m speaking right now, by focusing on just one sound. Listen to the episode three of the Power Learning Podcast to hear more about that. But so in addition to going over Master English Conversation, and doing those lessons for this month, for February, uh, they also got to practice working on their sounds, and making sounds, and improving their flow. And it’s amazing to see even just a…a few weeks of practicing…I’m so excited to see what they do after two month, and four months, and six months, and even a year in this, uh, in this kind of fluency course that they’re on right now. It’s really amazing what they’re doing. And I’ll turn it over to them right now, so you can listen. They will introduce themselves, and they will talk about what they did for their special mission homework assignment for February, and then I will come back and give a tip for everybody right after this. Yen:	Hi, my name is Yen. Well, I think Master English Conversation is very great. Listening to the English conversation help me know how English conversation flow. I spend about two hours a day listening to the lesson so that it can go deep into my brain. I can also learn a lot of words, [inaudible 00:18:39] and questions, and how to use it naturally. For the special mission homework assignment for February, I decided to get a cat. My grandmother got five cats, so I chose one and took it to the house. I call her Fuzzy because her tail always [frizzle ?] up just like a squirrel. Caring for her make me happier. This is the first time I taken care of something, so I feel very happy to do this. Uh, I really like to feed her. You know, in Vietnam, people do not buy cat food for cats. I just feed her some rice and fish, and she seems to really like it. She provides me a lot of fun. I can play with her when I feel lonely, and hug her when I sleep. Uh, when I brought her home, she had been pregnant, so it wasn’t a surprise when, um, she gave birth to kittens three days ago. I really like newborn kittens. They are very small, adorable, and so cute. I found that Fuzzy really loves hug, kiss. Uh, she grooms her kittens regularly, and doesn’t go far away from her kittens. I thought it was interesting, you know. Not only human have deep emotion like love. I think cats also love hug, kiss very much, and I think she loves me as well. Thank to your homework, I got amazing, pet, so thank you very much. Bye-bye. Bhaskar:	Hi, there. I’m glad to tell you about my experience with February’s Master English Conversation lessons. In this talk, I’m going to tell you about how my practice was going on with the last month’s lesson set, and what I got from it, and how the [pets ?] [inaudible 00:20:54] took place in my life. But first, let me introduce myself about my name, and where I am coming from. Well, my name is Bhaskar, and I am from India. This lesson set includes five lessons. Except the first one and second lessons, I studied each lesson a week. That’s the method Drew suggested, and I decided to go in that way. More repetition is a way of subconscious learning to achieve complete fluency. Actually, when I got the scholarship from English Anyone, I was confident that by the end of this course I’d be fluent. But after completing the first lesson set, I am super confident about my fluency by the end of this course. I learn several things from this lesson set, like how to use filler words, the intonation, and how to speak with confidence, and how to learn English through our interests. This lesson set is all about pets and animals, and I never [inaudible 00:22:00] while studying these lessons, but interested more. Actually, I was not a pet person, but, uh, I like them. [Inaudible 00:22:10], likewise. But while I was studying this lesson set, I had a thought. What if I had a pet? And I was almost ready to take a dog, but something pull me back, considering the fact that, uh, I’m not able to take care of a dog nowadays. Because, uh, I’m a little bit busy. So I procrastinated my decision till next year. But I had two incidents in my life that related me to pets. One was when I was a kid studying eight standard. My cousin gave me a small aquarium, and I kept it for almost one year. But after that, uh, I returned it back to him for some reason. And the second one was, uh, I did pet sitting a couple times for my friend’s dog. My friend’s family lived next door to us, and they had a dog. And when they were ready to go out of town, they left their dog at my home for a couple days, and I had to pet sit for it, like providing food, taking the dog to walk, etcetera. And last year they moved to another town, so no more pet sitting. I like gardening very much when compares with pets. At my home, we have some flowering plants, a tiny garden. I don’t know you guys call it, uh, this is a garden or not, but if you don’t have much space for a bigger garden. I like to water these plants, and take care of them. The plants we have here are chamomile, firecracker, yellow marigold, and hibiscus. In my home place, uh, we move here a few years back, but before that in our home place we had enough space for gardening. And we had a lot of plants and trees. Like, uh, we had four coconut trees, guava tree, pomegranate, and many other plants. Before completing this ta…talk, I have to mention one thing, that, uh, Drew always says develop a bridge that connects our interests and our English fluency. Actually, before this lesson, I didn’t know how to call many plants, flowers, fruits, [inaudible 00:24:50] and animals in English. But, uh, after completing this lesson set through this assignment, I found all these English names, and I know now, uh, how to call it in English. And, uh, in future, whenever I have a discussion about the plants and animals with anyone, I’ll never have a problem describing the plants and animals. Thank you, guys, for listening this a little talk, and have a wonderful day. I will meet you in the next month’s assignment. Bye-bye. Jaroslava:	Master English Conversation is program for study real English. It’s total different way to study English than in school, or other computers programs. It teaches how to understand real English conversation, how to use grammar naturally and automatically. Before I knew [inaudible 00:25:55] grammar, and a lot of vocabulary, but how to speak I never how to use grammar in the conversation. I was scared of English speaking. I had locked my mouth. Master English conversation unlocked my mouth. I don’t worries about speaking. I am more relax. I can speak short sentences now. In past, present, future tense. It’s great for me. I can retell the short conversation. For the special homework for February, I got two goldfish. My sons gave them names. First one is James Bond. Second one is Indiana Jones. First we had to prepare a goldfish tank. Clean out tank with water. Clean decorations with water. Do not use soap at decorations. Fill tank with water. The optimum water temperature in a goldfish tank is between 20, 22 degrees Celsius. Add fish to tank. We must change one quarter of water monthly. Goldfish love to eat, and eat, and eat. We may feed several times daily. Goldfish are social fish, so we have two fish. Live five, ten years. Do goldfish sleep? It’s a great question, because the answer is both no and yes. No, they do not ever close their eyes. They actually physically can’t close their eyes. But, yes, they do sleep. They sink to a low position in the water, and not to move. They, uh, do…They do this several times a day. Every information, uh, about fish, I found on internet. Every day I said my goldfish, hello. How are you? What we do today? Then I continue to wait. We can watch TV, or listen music. Then my goldfish, James Bond and Indiana Jones, replied, we can listen to listen English Anyone. Then I went, we listen this lesson yesterday, [and James was like ? ], we like it, we want to listen it [repeatly ?]. And surprised, I said, oh, really? I have to study English every day now. Carlos:	Hi, everyone. It’s me, Carlos. I’m very happy today, and really excited about my first audio and homework assignment. And I’m…I’m going to say that, first of all, um, what I think about Master English Conversation is that there are…there are great teachers. And, uh, especially Drew, because he’s a good…a good man. And, uh, he’s really commit, committed, in this…uh, in this job. Uh, his job is very…is very good. I don’t know how to explain it, but, um, I would say that, uh, Master English Conversation is a cute place to learn English. Not because it’s, um, I’m was winner of a scholarship, but I thought when I starting to learn English, um, in, uh, in English Anyone, that it…it is a good program. It’s a good…it’s a good place to learn to the…Many things that we don’t know, like words like slangs, like idioms, like phrases that American or English speakers normally say. And for me, Master English Conversations is very good for that, because you are, um, very…very close to…to really, um, uh, English speakers. And for years I was a kind of stuck in my grammar, in my fluency. Well, I’m not that good, but definitely in this brief, um, period that I has been in englishanyone.com, uh, it was…it has been really helpful for me. There’s really…there are really good [inaudible 00:31:43]. And I learn many things. For example, um, that blending is a good, um, is an important things of…of English, and because of American…Well, English speakers, uh, talk to people like that, and they are speak…speaking very fast. And blending sounds is very important. Um…Besides grammar, actually. Because you can be able to understand the grammar, but the real speaking, the real talk, is very tough. Is very…Sometimes I don’t get at all when I listen to native speakers, but for that reason I…I’m going to say that, um, one of the things I’ve learned is that blending sounds and, uh, imitate some sounds, um, because it’s very…it’s very important. Well, I been, um, with, uh, my…my plant, I bought a plant. Um, it’s a…it’s a good plant. It’s a [inaudible 00:33:08] plant. And I…I bought it, um, some days ago. Uh, it is a good plant, actually. Um, it’s a…Gazania. Gazania. Yeah It’s from Africa, and what I’m learn from it is that, um, I…I never…I had never had a…had had a plant before. And, uh, for me it’s…it’s a kind of…Well, I’m starting, um, of gardening. I could say that. And, uh, my plant is very tough. It’s one of the toughest plant that can flourish in whatever place. And for that reason, I…I learn from it that, uh, it’s always…blossom. It’s always flourishing, uh, through the year. And for that reason, I…I’m so proud of it. It’s a…it’s a good plant. Um…I watered it, uh, every day, and I say that it’s…it’s, uh, my favorite plant, uh…I don’t know enough anything about plants before, [inaudible 00:34:35]. It was really…it was really interesting to investigate about its history, its benefits, or…or its [futures ?]. And it was…it was really interesting investigate about my plant. Um, I’m going to be [carrying off…off of ?] it, and, um, this is the…my, my…my speaking for…for this month. I…I think it’s, uh….it’s a little bit, um, not fluently yet, but I think and I’m pretty sure that this is going to be, um…a good study. Yeah. Okay. Bye-bye. All right, I’m back. Didn’t they sound great? I’m so proud of all four of you guys. Carlos, that was fantastic. And Jaroslava, especially, you’re…you’re starting to use more, you’re really using the native vocabulary there. Instead of saying he said, the fish was like. Yen, also your pronunciation is fantastic. It’s really sounding more confident. Uh, and Bhaskar as well, uh, t’s…it’s amazing, like just what you’ve…what you’ve already been learning this month and how you’re going out. And even if you didn’t get a pet this month you went out and you learned about your plants and other things that are in your garden. And I’m,…I’m really just so proud of all you guys. Keep going. You’re an inspiration to everybody that’s studying out there. Uh, and I’m really excited to see what you do for next month. Well, to help you move along to next month, so again, last month we practiced on improving your accent by focusing on just one sound. But now I want to move a little bit deeper into fluency, uh, and this is finding your wedge, or finding your…your kind of cut into something. Uh, remember that you should only be focusing, at least, uh, most of the time, on something you’re interested in doing in English. This is the real key to getting in, and I want you to take kind of two things. The first one is something you’re really interested in, and the second thing is using one of your talents in order to get fluent faster. So it doesn’t matter what that thing is. If maybe you’re a good singer, you can use your beautiful singing voice and try singing more in English. And you’ll get some of that from this month’s lesson, I’m sure. In my case, I like to mimic sounds. It could be the sound of a door opening, it could be the sound of a car going by, or anything like that, but I really like to mimic sounds. And so, for learning languages, that’s kind of my talent that I use for trying to practice my Japanese. There was actually one instance, the, uh…We don’t really have this in America, or maybe in some places we do, but in many, uh, crosswalks here in Japan there are sounds that come out. It’s kind of like a…it’s like a chirp, like, [whistles]. Uh, I don’t really want to whistle now, because it will make the microphone crack, but basically there are two different sounds for, uh, whether or not you’re crossing the street one way, or crossing the street the other way, so that, uh, blind people can hear which…which kind of color the traffic light is. So it’s a really nice thing, uh, but I like to mimic that sound. And one time I was at a park with some of my students, and I was making that sound, and some ladies actually tried crossing the street when I made that sound. So I was really happy that I was able to do that. It’s kind of dangerous but…but anyway. So me thinking about my interests, so one of my interests was gardening. That’s the reason I came to Japan, and I was able to find a Japanese teacher. And he didn’t speak any English, and I barely spoke any Japanese when I first met him, but we connected with gardening. And it’s kind of like you find a…uh, like you’re a, a, a guy travelling and you meet a nice lady, and maybe you don’t speak the same language, but you fall in love anyway. It’s the connection that’s deeper than just the language itself, and then you…you build the connection through the language after that, but you don’t need the language at first. So remember these two things as you work to get deeper into English and to build your fluency. English is not the focus. You want to do something in English, and then English becomes a natural result. It comes out of your studying and your interests. So your…your interest, maybe you really like the English language itself, but I promise you, you will learn much more if you go out and really get into something in English. So, for you four winners, I’m…I’m so proud of you. 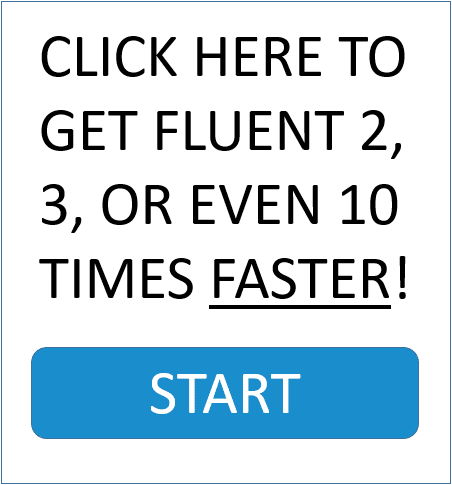 Again, use this tip to go deeper into your fluency. Find something that you’re interested in, and do it in English. And the other thing is, use a talent that you have. If you’re really good with remembering things, then go out and try to master a lot of words. If you’re really good at singing, then work on your pronunciation. It could be anything, but it should be something you do very easily, uh, and very naturally. So at the start, you always want to make it nice and easy and fun, so you get a lot of power, a lot of confidence from that, and that will push you to do more. Again, I really look forward to listening to all four of you guys again next month. I’m so excited to see your progress, and I’m really happy at how much you’re already been speaking. Go back and listen to how you were speaking last month, even just…Again, it’s…it’s amazing. Even just a few weeks. Uh, I’m so proud of you, and it’s…it’s, uh, something you should really be proud of yourself. So I’ll see everyone again very soon with more Power Learning podcasts, and I’ll come back again with another Power Learning Podcast with the tip for next month, after they finish this new special mission homework assignment. Well, we’ll tell you more about that later. 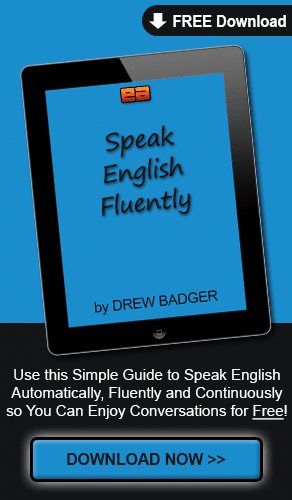 Have an excellent day, get out, and enjoy getting fluent in English faster. Bye bye.